Bayview’s principals have completed over 80 merger transactions representing sellers and over 20 transactions representing buyers in the past three decades. Bayview’s focus is on middle market sized transactions, representing sellers. Typically, these are companies with sales between $10MM and $100MM that have a defensible niche in their respective marketplace. 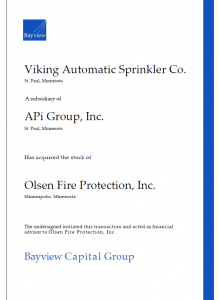 Below is a partial list of recently completed transactions. 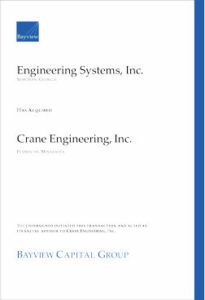 Bayview Capital Group announces the sale of its client Crane Engineering, Inc. to Engineering Systems, Inc.
Trystar is recapitalized by GHJ&M along with members of management. 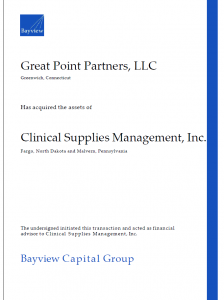 Clinical Supplies Management, Inc. has been acquired by Great Point Partners..
Indigo Signworks, Inc. has been acquired by Akoya Capital Partners LLC together with Management..
Stellar Technologies, Inc. has been acquired by Cirtec Medical, LLC, a portfolio company of Century Park Capital Partners..
Scientific Plastics Corporation has been acquired by Pexco, a portfolio company of Odyssey Investment Partners..
Network Imaging Solutions has been acquired by Derby Industries LLC, a portfolio company of Hyde Park Holdings LLC..
Cass Screw Machine Products, Inc. has been acquired by Heartland Equity Partners.. Innovative Laser Technologies Inc. has been acquired by Generation Growth Capital, Inc..
LSI Corporation of America has been acquired by CoBe Capital. Shoremaster Inc. has been acquired by High Street Capital. Bayview arranges new equity funding for Recovery Technology Solutions. Wilson Tool has aquired Exacta Precision and Exacta Fabtool. Pfingsten Partners, LLC has acquired Midwest Products and Engeneering, Inc.
New York Mint, Ldt., has been acquired by a private equity firm. Hawkeye Corrugated Box Company has been acquired by Buckeye Corrugated, Inc. of Akron, Ohio. Quadrivio SGR S.p.A. has acquired the stock of Audio Research Corporation. Linatex Corporation of America, the U.S. affiliate of Linatex, Ltd and portfolio company of Navis Capital Partners has acquired the stock of Durex Products, Inc.
Tonka Bay Equity Partners has aquired Aero System Engineering Inc. Otter Tail Corporation has acquired the stock of Idaho Pacific Holdings, Inc.
A Private Equity Fund acquired assets of A Dental Laboratory. CHB Capital Partners formed a Schott High Reliability LLC to acquire the high reliability devision of Schott Corporation. Preco Laser Systems, LLC. acquired the assets of Laser Machining, Inc.
Catalina Yachts, Inc. purchased three product lines from Johnson Boat Works. Varistar Corporation acquired T.O. Plastics, Inc.
Seidler Haas, LLC purchased Idaho Pacific Corporation. Melges Boat Works purchased the manufacturing assets of Johnson Boat Works. Trans-Consolidated Inc. was re-capitalized by a Private Investment Group. Check Gallery, Inc. An MDC Company acquired the assets of Message! Products, Inc.
Cady Communications, Inc. merged with ATI Advanced Telecom., Inc. with equity provided by Stolberg Partners. Advanced Telecom Inc. purchased the business of One Call Telecom, Inc.
Heartland Companies, Inc. divested Heartland Promotions to Wordsquare Pub. Co., Inc.
United Rentals, Inc. purchased the business of Carlson Equipment Company. Netdirect Corp Int’l purchased Tech Squared, Inc.
Treval Holdings, Inc. acquired the assets of McNally Industries, Inc. 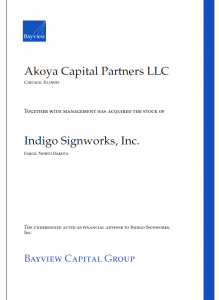 Copyright © 2018 BAYVIEW CAPITAL GROUP - All Rights Reserved.